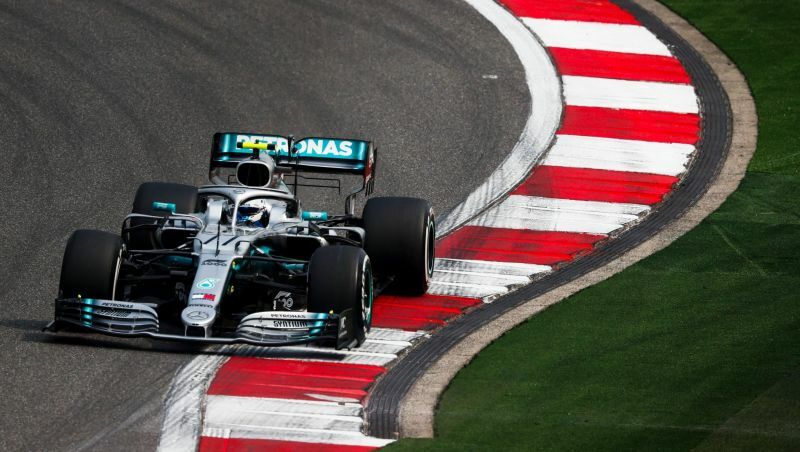 SHANGHAI: Valtteri Bottas has set the early pace at the Chinese Grand Prix, topping the practice time sheet for Mercedes with a narrow margin over Ferrari’s Sebastian Vettel. The Finn’s best time of one minute 33.330 seconds was just 0.027 seconds quicker than Vettel’s best effort, both drivers setting their best times around half an hour into the session. Max Verstappen was third quickest for Red Bull Racing, 0.221 seconds off the pace. The top three drivers split sector honours, with Bottas, Verstappen and Vettel quickest in the first, second and third sectors respectively. Cool ambient temperatures made for a tricky afternoon in Shanghai. The thermometer stubbornly remained below 20°C, and as the sun disappeared into the haze, track temperatures fell into the low 30s. Early spins for both Bottas and teammate Lewis Hamilton were testament to the cold track temperatures, though both recovered easily from their misadventures. Hamilton, however, failed to find the rhythm his teammate managed, leaving him in fourth place and 0.7 seconds off the pace. The result is an unexpected boon for Mercedes, which came to the Shanghai International Circuit expecting the track’s long straight to heavily favour Ferrari and its class-leading power unit. That Vettel was fastest in the final sector, which comprises the 1.2-kilometre back straight, suggests this advantage remains but that the Mercedes is better balanced through the circuit’s tricky corners that places unusual strain on the front tyres. Renault’s Nico Hulkenberg slotted himself just behind the Briton, using Hamilton’s out-of-sorts performance to flatter his Renault car by ending the day less than 0.06 seconds behind the world champion. But the real battle for the German will be behind him, with Carlos Sainz, just half a tenth slower, setting the sixth-fastest time in his McLaren. Charles Leclerc was just seventh fastest for the afternoon, 0.8 seconds behind Vettel. The Monegasque driver, who would have won his first grand prix last round had he not lost engine power in the final laps of the race, ended his practice after just 13 laps when his team brought him back to the pits to undertake precautionary cooling checks on his car. Both Leclerc and Vettel changed the control electronics units in their power units before the start of Friday practice to address the problem that befell Charles in Bahrain. Lando Norris was eighth for McLaren, pipping Renault’s Daniel Ricciardo by 0.04 seconds, while Red Bull Racing’s Pierre Gasly ended the day in 10th place, 0.9 seconds behind teammate Verstappen. Kimi Raikkonen was 11th fastest for Alfa Romeo ahead of Alex Albon and Daniil Kvyat, the Toro Rosso duo enduring a mixed afternoon. Thai driver Albon ended practice with his front brakes on fire after being caught behind Vettel’s stopped Ferrari in the pit lane. Both drivers missed their call to the FIA weighbridge for legality checks, but whereas Vettel’s team was nearby to push him back towards the scales, Albon was forced to wait for support, during which time his brakes set themselves alight. Kvyat, on the other hand, missed half of the afternoon practice session in the garage as his team undertook a power unit change on the advice of engine supplier Honda, which had detected anomalous data during the morning. Racing Point teammates Lance Stroll and Sergio Perez were 14th and 15th ahead of Haas drivers Kevin Magnussen and Romain Grosjean, the last-named driver having suffered an inexplicable partial front wing failure early in the session. Alfa Romeo’s Antonio Giovinazzi finished 18th after effectively sitting out the morning practice sessions with a power unit problem, and Williams drivers Robert Kubica and George Russell ended the day anchored to the bottom of the timesheet.